New entrants to our industry today are faced with a very different landscape to the one that existed twenty or more years ago. Changes have been driven by factors such as: Ever increasing pressure on costs, the digital revolution being seen as a panacea, the fragmentation of the industry into smaller organisational units and a largely freelance workforce, and a culture that does not seem to support development and training at anywhere near the levels seen in the past. Production budgets are always under pressure. The expectation that 'digital' means that more can be done with less, was undoubtedly true to an extent, but now we seem to have gone beyond that 'digital dividend' and budgets continue to be driven downwards. To meet these demands, training is often first in the firing line. It is an easy target because it has such little impact on the quality of what goes on screen. This short-termism has become culturally embedded in many parts of our industry, so it should be no real surprise that now there is often a problem in recruiting suitable people into key team roles. The digital age has brought with it the perception in some that content generation and distribution has become so simple that almost anyone can do it. Digital kit is, on the whole, much more reliable these days. Some make the leap to thinking that because the systems don't break down as much, then everything is simpler. The opposite is, of course, the case. The hardware and software systems we use are far more complicated, and the skills and knowledge needed to operate and maintain them successfully are every bit as deep as they were in the past. Using people who cost less but are lacking in relevant skills can be very expensive, even in the short term. What price do you put on a lost day's filming because the DIT (Digital Imaging Technician) didn't know what they were doing? Maybe dropping a runner who seemed to be able to manage their smart phone technology pretty well into the role wasn't the best idea after all. Then there is the fragmented nature of the workforce. Most production crews are freelance, and who will pay for their training? If you are hiring a new crew member then you want someone with the right experience to perform professionally, reliably and technically, and fit in with the rest of the team. So how does a new entrant break into this and gain the relevant experience to become a valuable freelancer? Look at the production teams of some long running series and you might find the same crew has worked for maybe 5 years without change, and all are over the age of 45. Over the last 30 years of designing and delivering training courses for media organisations, I have seen the significant changes that have taken place in attitudes to training within media organisations. Twenty-five years ago, many broadcasters had a training department, with a training manager, training officer and training administrators. But then, many more staff were employed in programme making, with much fewer freelancers. The BBC had a thriving production operations and engineering training culture centred on Wood Norton. Now most productions are crewed by freelancers, who are left to provide their own training and development, and the responsibility for in-house staff training is often put on departmental managers who take a 'just-in-time' approach to training when new technologies or new kit arrives on the scene. Longer-term staff development takes a much lower priority, or does not exist at all. As a result there is a skills gap, with industry desperately seeking suitably qualified, experienced and motivated team players for key roles in the content chain. So, what might we be able to do to counter this and begin to move to a more enlightened culture in the media industries, truly appreciating the value and potential of those making up our workforce? Well, some larger organisations like BBC, Sky and BT have woken up to the fact that they will need to have long term continuity in the workforce to keep them supplied with proficient, productive and creative technical and production staff, and have launched a variety of apprenticeships and similar schemes. These and other similar initiatives are most welcome and will soon begin to bear fruit. What more could be done? It seems to me that we need to address the issues described above from as many different angles as possible. Employers should not expect that a graduate fresh from a media production or media technology course can necessarily walk right into an on-set role. It should be the role of HEIs (Higher Education Institutes) offering practical media production and technology courses to develop individuals so that they have the potential to fulfil a role, with as much knowledge and practical experience as possible within the confines of a HE course. HEIs do not make job-ready graduates. For that industry must take some responsibility, reduce its expectation of degree courses and therefore graduates, and work more closely with HEIs to offer realistic, and valuable work experience opportunities on real productions. It should be the norm that there are always trainees and work experience students on productions and in all parts of the content production and post-production chain. This would also help to make graduate expectations more realistic. We need a way round the following conundrum. 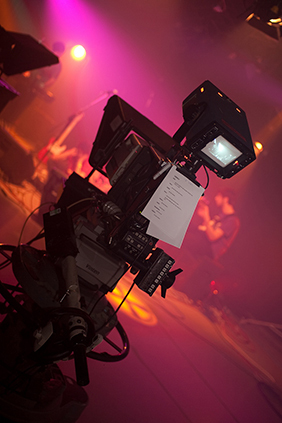 At the best institutions undergraduates are exposed to realistic production workflows and working conditions, in multi-camera HD studios, making programmes at a professional level, and guided by industry professionals. It should not be altogether surprising that some might come away with the belief that they should expect to move straight into the equivalent roles on real budgeted programmes or features. Blending realistic reminders of their standing in the real world from tutors and better integration of suitably structured real work experiences can perhaps address these false expectations. So encouraging more industry/education partnerships looks like a solid way forward. Industry to provide the experience of real working conditions, while education provides the underpinning technical knowledge and individual developmental and personal skills within a structured simulated work environment. The Skillset Tick scheme and the BKSTS Course Accreditation scheme are two distinctive schemes of industry-based accreditation of degree level courses. Each takes a different approach and has a different range of benefits, but they are both aiming to raise the standards and relevance of degree courses aimed at producing graduates for our industry. The ITTP (Institute for Training in Television Production) is taking a complementary approach with its Approved Skills scheme to accredit individuals. It is early days for the ITTP scheme, but I believe that the double-handed approach of accrediting both courses and individuals should help to define the requirements our industry has for its key production and technical roles, provide an industry-accepted benchmark for those roles, and provide opportunities for collaborations between industry and education to improve the calibre of students and other new entrants into our industry.